tremendous value in this quality built caraco home in popular greenwood park. 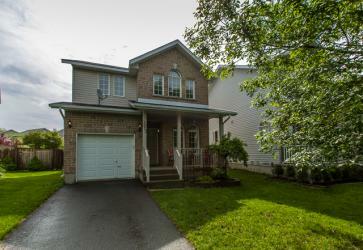 located close to cfb, trails, parks, shopping and schools. main level offers open entry,den/office,powder room all with ceramic tile and kitchen, dining/ living room with vaulted ceilings and newer hardwood flooring. upstairs three generous sized bedrooms and full bath. move in ready - decorated in neutral colours, unfinished basement with three-piece rough-in awaiting your final touches!